Two teams of mercenaries vie for control of a triangular cluster of NULL cannons within the northern part of this region. Some sectors of this conflict zone are declared off-limits for this operation, reducing the combat area. The battle continues until one of the MCCs is destroyed or until one side depletes the otherGÇÖs clone supply. One thing I'm noticing right off if the map is installation correct. Blue has a supply depot, red doesn't. Surface to Air Missile installations!!! New toy to play with??? Why would anyone use dropships on this tight map? So why bring SAM turrets? Hmm yeah and blue also has a neutral supply depot and the only neutral turret on their side of the map. I could understand to a point if the defenders had a slight terrain advantage on some maps, but this looks to be a little attacker advantaged on first impression. Also all these SAM turrets are on the attackers side where the defenders have none and the attackers have no STS turrets unless they hack the neutral one. Just my opinions from the screenshot, we'll see how it plays out. Looks like an offense vs defense map to me. Red seems to be offense and closer to objectives, while blue seems to be defense and farther from objectives. Even if blue gets all the objectives, they are too close to red spawn point to really progress any further. If red captures all three, blue has the advantage of staying back and defending the areas better. Absolutely nothing's changed in this map other than you're spawning -closer- to each other. Sure, good for the instant gratification types but spawning in at objective A just to get killed by three-four guys with pistols/militia rifles at the clone reserve unit directly north of it isn't good for isk. Staying away from this map from now on. Risk doesn't meet with the reward. But the map legend shows blue to be attackers and red to be defenders. Ok, you lot seem to misunderstand what these maps are. In the announcements for these new maps it clearly says 'new map variations', nowhere does it say 'new maps' so stop complaining. clearly says 'new map variations', nowhere does it say 'new maps' so stop complaining. That's just simply the point the game is Beta and there still testing "variations" of games and maps to see how it works or doesn't. That being said played this earlier and it does seem to be weighted to the reds (apparently defenders) favor 4/1 in game. Its tough if your blue (attackers) but that's the idea right? You sir, weren't paying attention. 'New map variations' does state 'new map' so yes it does say new map. Just not the way others had hoped. I think what they're really testing here is the ability to stream info to existing terrains without downloading an update. They use the same map and change up the coordinates on the redzone and installations. What I was expecting was a change in large structures within existing terrains at least. 3 objectives are too close, and it makes dominating too easy since close proximity makes it easy to defend all at once. Redline boundaries too tight, not much room to maneuver and flank attack objectives without being spotted coming. All battles I did were one sided. 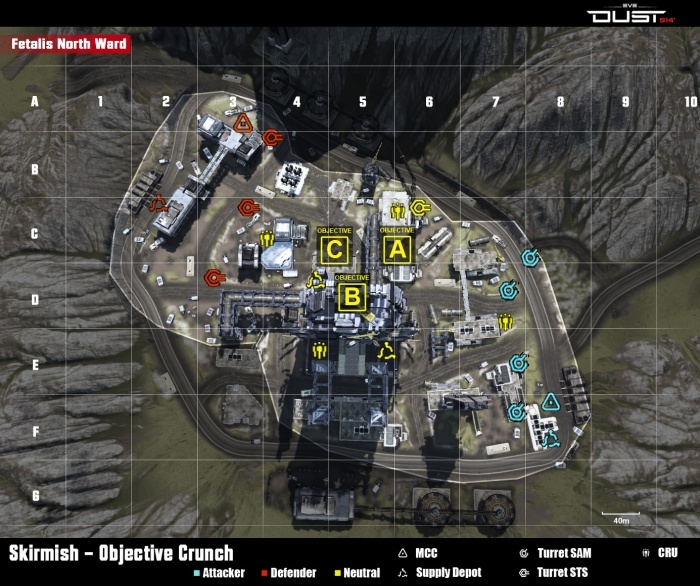 If you are on the west side (blue) and the reds get the the objectives you might as well log off because your are NOT going to win..
Who designed the two new skirmish maps? Stevie Wonder??!!! I gotta say I like this setup. The grouped turrets provides a great area of defense for Planetary invasion by a merc. or enemy team, allowing them a foothold for planning. The defenders could just as easily spawn one tank and keep their eye for aerial transports. When the stakes are high for the defenders, those turrets don't have a chance with maintained orbital strikes. Sounds fair to me. It SHOULD be one sided. With two highly skilled teams and Eve supported teams...it sounds like a battle below and above. Now if you could actually make PI in lowsec worth that much for someone to care. Decrease the m3 of PI materials. It's too much of a hassle/risk for a corp without a jump freighter. This map is my favourite of the new ones - both teams have safe staging areas and either one can still get back in the game if all objectives are lost (as blue you can easily sneak around the back of A and red can easily get in behind B). good map that mixes frantic action of ambush with the strategy of skirmish. These new map variations are fun. Keeping in mind that these variations are to test game mode types, this one seems like a "Rush Mode" streamlined for suit combat in close quarters. The map is misleading, it looks like red is closer to the points, but that is wrong. Red's spawns starts in the vary back, Blue's spawn is practically on top of point Alpha. Also the turrets are a bit unneeded, the squeezed redline make vehicle use impractical. All in all, i think this map was fun to play. I think this is a great map to bring a persistent squad into. Had a go on this map earlier and it was an entertaining match, the fact that the map is biased to wards the defenders made it even more so as the side i was on the attackers really had to work together within there squads to find a way through the lines of defense to take over the objectives! All the new maps are interesting, and breath of fresh air to mix things up. the main issue I found was entering a match and it being half over or 70% over, with no chance of pushing out of your spawn. When you get the opportunity to play any of these maps from the beginning, they are quite fun. The return of the lobby system is great, although some indication of progress on maps would be great.